in both Makeup & Hair. To celebrate five years in business I was excited to open my first bridal exclusive makeup and hair studio in the Victorian seaside town of Southport. After being there for 10 months it was apparent that I needed to expand and relocated to my new fabulous and larger premises in the small village of Little Hoole near Preston. This has allowed me to carry on with my lovely bridal trials and given me the space to fulfil my dream of opening my own private training academy which will launch at the beginning of the new year, (exciting times ahead). Beautifully decorated in grey and white with hints of pink (my favourite colour) this new premises is my little haven of all things makeup and hair. Natural light floods in from the floor to ceiling windows so its perfect to create bridal makeup as the daylight replicates your wedding day light and makeup tones are not yellowed by artifical lighting. Therefore a true representation of what you will look like on the day can be achieved. 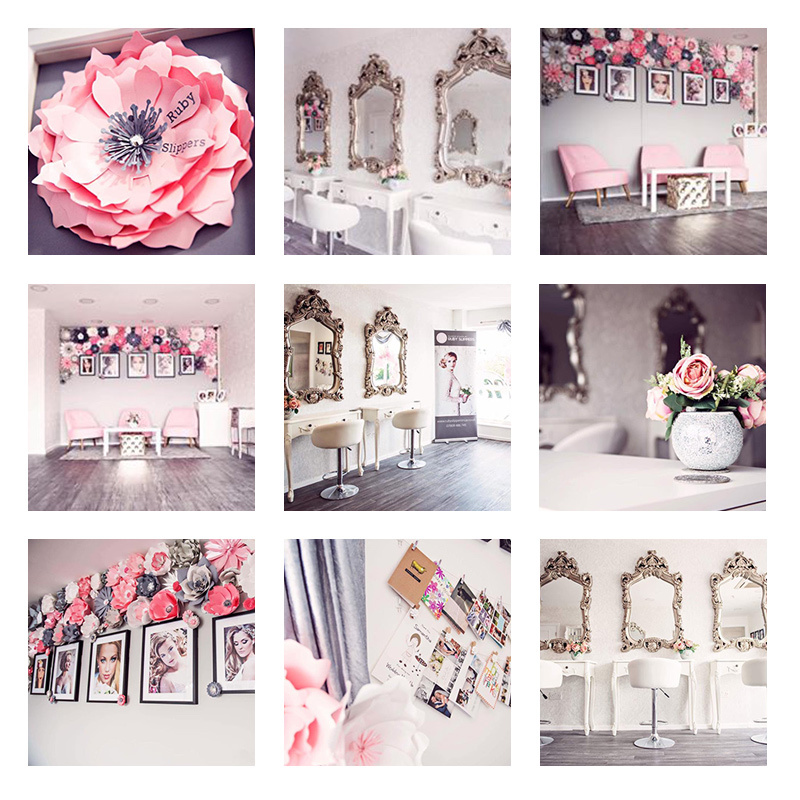 We have a beautiful seating and consultation area where Mums and members of your bridal party can sit, to watch your dream makeup and hair be created and come alive whilst being surrounded by our bespoke designer flower and picture wall which is my pride and joy. You get exclusive use of the studio during your trial and there is plenty of free parking on the courtyard outside. Bridal makeup and hair trials take approximately 4hrs and a makeup or hair only trials 2hrs. Bridal trials are essential starting with your consultation over a cup of tea or coffee where we can discuss your likes and dislikes, talk about the style of your wedding and work together to choose your perfect look for your special day. Bridal party trials can also be undertaken on the same day as a bridal trial but these aren't essential and classed as a luxury. We can discuss the styling of your party at your bridal trial if you wish to attend alone to keep everything a secret until the big day. I am an exclusive stockist in the lancashire area of bespoke headpieces by Gypsy Rose Vintage which can be made to order, we also have a full range of headpieces by One Fine Day Bridal (our lovely neighbours) which can be used as part of your trial as well as veils of different styles and lengths which are kept in the studio. I find that alot of brides dont choose thwir headpieces until they have had their hair trial so this is a great place to start. HD Airbrush makeup, colour matched hairpieces, skincare and luxury lashes are all available in the studio alongside our vast array of professional products from Illamasqua, Mac, Nars, Bobbi Brown, Urban Decay, Anastasia Beverly Hills, TIGI and Beadhead. I look forward to welcoming you soon into my little bit of makeup and hair paradise.